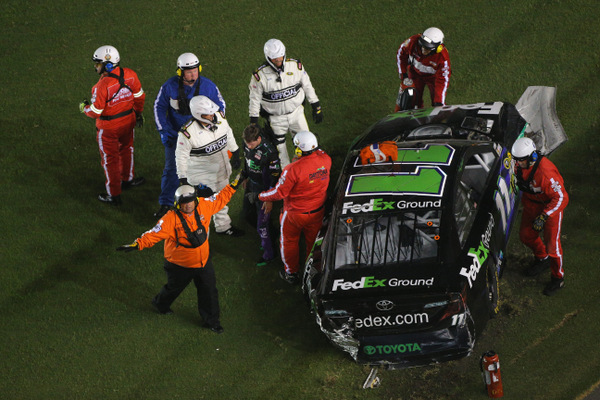 It was a night of vicious crashes, and NASCAR's attention to safety issues may be a prime topic, again, in the coming days, after another savage crash for Denny Hamlin. Twenty-one drivers, nearly half the field, were involved in crashes, and and winner Jimmie Johnson had a big hand in at least one of them. But the stock car tour leader, in a dominating performance in the Coke 400, escaped the carnage and went on to win his fourth of the season, in an overtime shootout. Hamlin was among those not so lucky. He crashed twice, and his nose-first smash into the outside wall -- a section not protected by the soft-wall Safer barrier that has become a major safety plus in this sport -- was Hamlin's second mean hit in the past six days. Johnson was in control virtually the entire race, leading almost 250 of the 400 miles; Matt Kenseth, curiously, never really got wound up into the game. 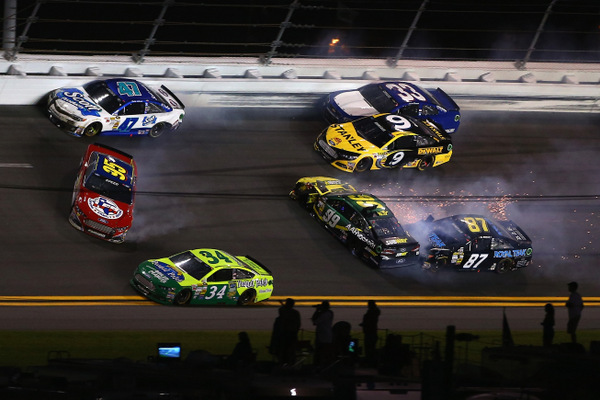 Johnson easily had the strongest car all night at Daytona International Speedway, but down the stretch he was playing defense, hard-nosed defense, blocking and slowing, to keep rivals from making any runs on him. And that may be a statement to any title rivals when the tour gets to Talladega this fall in the playoffs. Johnson, who opened the season winning the Daytona, thus becomes the first man in 31 years to sweep Daytona. And he did some amazing 'mirror driving' late in the evening, moving from one lane to the other and back, to confuse, confound and block rivals. But it was dicey in the final miles, with several very hard wrecks. And Johnson had to work to foil Tony Stewart, Kevin Harvick and Marcos Ambrose, the last men standing in the brutal event. "I thought Matt Kenseth would be the guy to beat, but he had some trouble," Johnson said. "But I showed strength early and a lot of guys were willing to work with me and kind of help me through situations, which was great. I don't know if I really made a bad move tonight, so I'm pretty proud of that." Not everyone agreed with Johnson's assessment, and Ambrose was one of the dissenters. One key restart came with 10 laps to go in the 160-lapper, when the race appeared to be down to Johnson and teammate Kasey Kahne versus Kevin Harvick and his soon-to-be teammate Tony Stewart. But Ambrose charged into contention, pressuring Johnson. In fact on the restart it appears Johnson made some bad decisions, in trying to block Ambrose and thus opening the door for Kahne. However Johnson, judiciously using his fenders, got out of that jam, and also knocked those two out of contention. Johnson, on the outside at the restart into turn one, moved to block Ambrose. Then down the backstretch with five laps to go, he blocked another move by Ambrose, squeezed Ambrose to the inside, and Ambrose wound up body-slamming Kahne, taking both out of contention. 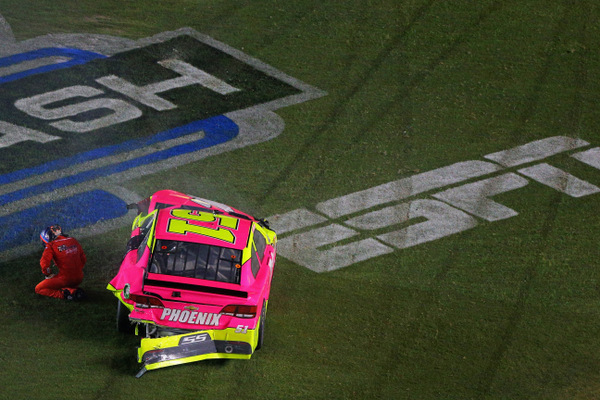 At that point of the race, most top Toyotas and Fords had been eliminated, and it was a Chevy night. But Ambrose, in a Richard Petty Ford, was suddenly making strong moves himself. Ambrose was making a good move on Johnson, who appeared out of position. "Jimmie got a little loose, or he just didn't see my move coming, and I split him coming off of turn two," Ambrose said. "He came down to check the spot, and I was already there. And he just bounced us straight into Kasey." Johnson brushed off the criticism. "He had a great run into the turn," Johnson said of Ambrose. "So I moved up to block it. Then as we came off turn two he came shooting down inside of me. I don't know what happened after that. I guess somebody got into Kasey." That set up the final restart with three to go, Johnson again on the high side, Harvick on the inside, with Stewart pushing Harvick. Neither man could make a move on Johnson. But two big crashes that last lap wiped out a number of cars. NASCAR didn't throw a caution for the first one, on the backstretch, behind the leaders -- Carl Edwards tangling with Ambrose and four others. 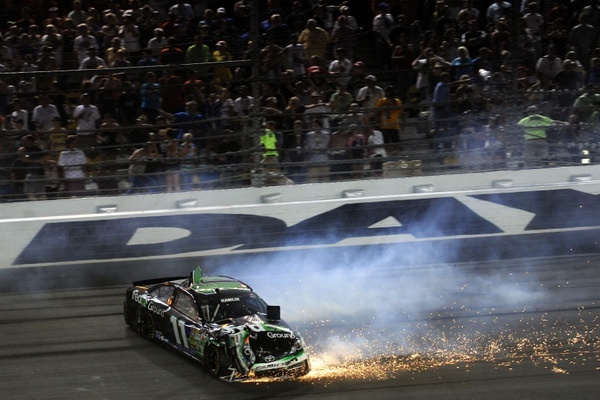 Then on the other side of the track, as Johnson roared toward the finish line, with Stewart and Harvick right behind, another crash occurred in the trioval, when Danica Patrick got tagged from behind, triggering a six-car melee. "I'm just glad I was ahead of the chaos at the end," Stewart said. "Luckily everything was for the most part behind us except for Kasey's deal... but that one didn't cause us any drama. We were able to stay on the gas and go on through." There were several other crashes too in the final miles, after the first two hours of dicey but clean action. Denny Hamlin was perhaps the biggest loser of the night. Fighting desperately to try to earn a spot in the playoffs, Hamlin first got tangled up when Martin Truex Jr. cut across his nose on the frontstretch, sending him down to the infield grass at the 250-mile mark. 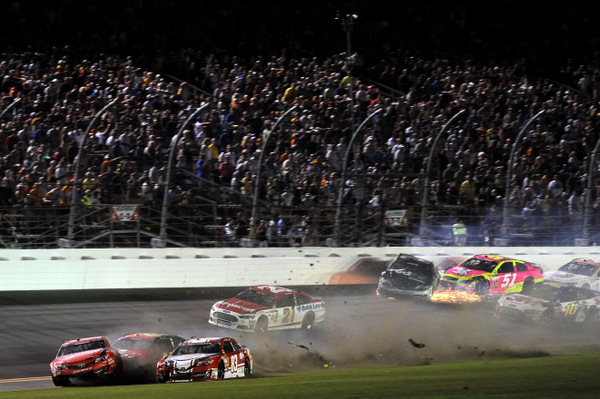 That incident also left Juan Pablo Montoya and Kyle Busch with damage. Hamlin managed to recover from that. But with only 25 miles to go, he took a mean hit, nose-first into the outside wall on the frontstretch. That savage crash took out AJ Allmendinger, Jeff Gordon and Matt Kenseth too, and it led to a 10-minute red flag to clean up the carnage. 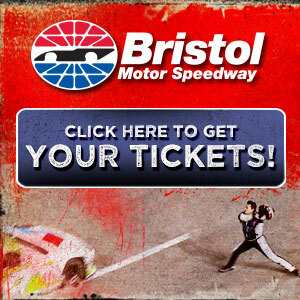 Hamlin's hit was into a part of the track where there is no soft-wall Safer barrier. And it was his second very hard hit in just six days. He had to get medical clearance after last Sunday's crash at Kentucky Speedway. Hamlin missed four races with injuries after hitting a wall in March at California Speedway which was likewise not protected by a Safer barrier. Jeff Gordon, who hit hard at Charlotte in May, at a place at that track not protected by a Safer barrier, has been very vocal in insisting NASCAR order tracks to install the soft-walls all the way around. NASCAR officials have not made any significant response to any of that. This race was quite unlike the follow-the-leader 500 here five months ago. Drivers were rowdy and aggressive much of the night, racing three-wide, even four-wide, and generally avoiding mistakes until the final hour. But the final 100 miles were quite different from the first 300. Harvick is known as a great closer, particularly at Daytona and Talladega. And he had Johnson in his sights in the final miles. "I really thought we were in the right spot," Harvick said of the final restart. 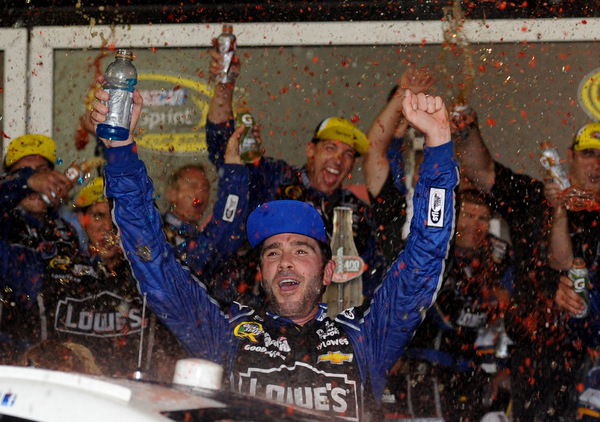 "I thought if I could just hold Jimmie (even) to Turn one, that the pack would form behind us. "Our line (on the inside) just never developed either time on the restarts, with two different cars behind us. "So it was interesting to see how the top line would form up, and they were just able to push by and get a run off of Turn 2 down the back straightaway and get by." Stewart, whose team has been far off the pace most weekends this season, found himself in contention late, partly because much of the competition had been sidelined. Whether Stewart could have done anything with Johnson in the final miles, if not for the chaos, is uncertain, as strong as Johnson was. "I didn't get to see him until the last two or three restarts there, but obviously every restart he was able to get to the front," Stewart said of Johnson. "The rest of the day I really wasn't able to see him. I know he led a lot of laps tonight, so they obviously had a fast car. "He definitely was strong on restarts. Being the leader helps in that, obviously, but he was definitely getting good jumps on the restart." Johnson has been twice burned on key restarts the past month, at Dover and Kentucky, and he has clearly been working on that part of his game. The night was a disappointment for most. 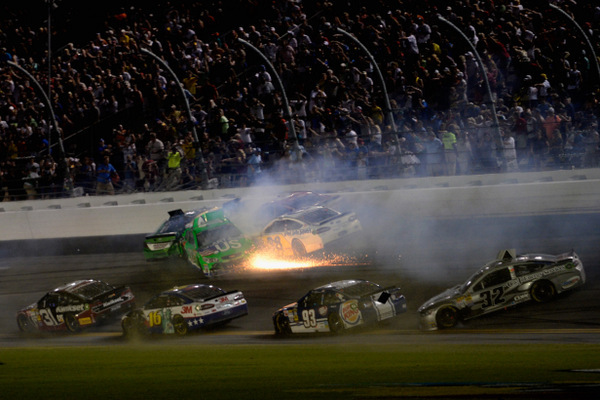 Joey Logano was the night's first victim, when a right front blew, putting him in the wall. "I really don't think I ran over anything, and in looking it over it looks like a shoulder failure to me," Logano said. "I don't know why. I haven't seen any tire issues out here." Submitted by The Great Waltripo on Sun 07/07/2013 - 21:04. I watched the replay many times, and Danica clearly came down on the car on the inside and took herself out.